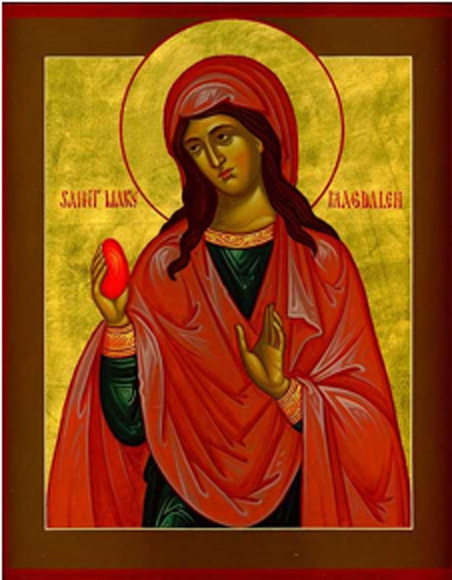 And heeding His sacred laws, O august Mary Magdalene. Through thy holy prayers for us. St. Mary Magdalene Orthodox Chapel is a chapel of the Diocese of Wichita and Mid-America of the Antiochian Orthodox Christian Archdiocese of North America Under the pastoral care of Fr. John Baize and the DOWAMA Dean of Chapels, Fr. Joseph Longofono. We are located at St. Mary Magdalene House, 913 Riley Lane, Manhattan, KS 66502 which serves as our chapel, offices (tel. (785) 539-3440) and an intermittent residence for visiting clergy. Divine Liturgy First and Third Sundays, Typica Second, Fourth and Fifth Sundays, except as noted in the Current Calendar. Fridays during Great Lent: 6 p.m. Small Compline (with Akathist Hymn, weeks 1-5, or Canon of St. Lazarus, week 6). See the Current Calendar for more details and a schedule for the prosphora baking rotation. In addition to the services offered by our community listed above, from mid-July 2018 the St. Mary Magdalene Orthodox Christian Chapel welcomes the offering in our temple of Sunday Prayers according to the usage of the Ethiopian Orthodox Tewahedo Church, led by Fr. Tesfaye Tadesse, most Sundays at 7 a.m. (See the Current Calendar for variations in the schedule or additional Ethiopian services at St. Mary Magdalene.) On ordinary Sundays this service will consist of the Daily Prayers, the Hymn of Praise for Sunday, the Anqets Birhan, Psalm 135 and the Prayer of the Covenant. Inquirers Classes for those interested in learning about the history, beliefs and praxis of the Orthodox Church, and Catechism Classes for those desiring to be received into the Church can be organized on request. If you are interested, make yourself known after services at the Chapel or contact David Yetter. Currently we are offering a series of Catechism Classes, fitted to the scheduling needs of the catechumens. If you are interested in joining the classes, please contact David Yetter to arrange for him to provide you with the schedule as it changes. The Didache Lecture notes on the teachings of the Holy Apostles from around the year 100. New Advent (From which the translations used in the MSWord versions provided above were taken). A small reminder: the chapter and verse citations to the Scriptures were not in the original documents, and were added by the translators. St. Mary Magdalene house is located at 913 Riley Lane in Manhattan, KS, and once one is on Riley Lane is easy to pick out: it is the tan house on the north side of the street with a large three-barred cross in the front garden and a large gravel parking area on the eastern half of its double lot. Approaching from the east along Ft. Riley Boulevard, turn left at Juliette Ave., cross the railroad tracks and make an immediate right. Follow Riley Lane past 9th Street. St. Mary Magdalene House is on the right. Approaching from the west along Ft. Riley Boulevard, turn right at 10th Street (near Howie's Recycling), cross the railroad tracks and make an immediate left. Riley Lane at 10th Street appears to be an alley or driveway (sometimes obscured by the trailer of a landscaping truck) directly opposite Pottawatomie Ave. Signs for both Riley Lane and Pottawatomie Ave. are on the same pole, but the sign for Riley Lane is hidden by another utility pole until one has almost reached the intersection. St. Mary Magdalene House is on the left. If our parking lot is full, please park on 9th Street, rather than in the parking areas belonging to neighboring houses or buildings. A map is provided below. 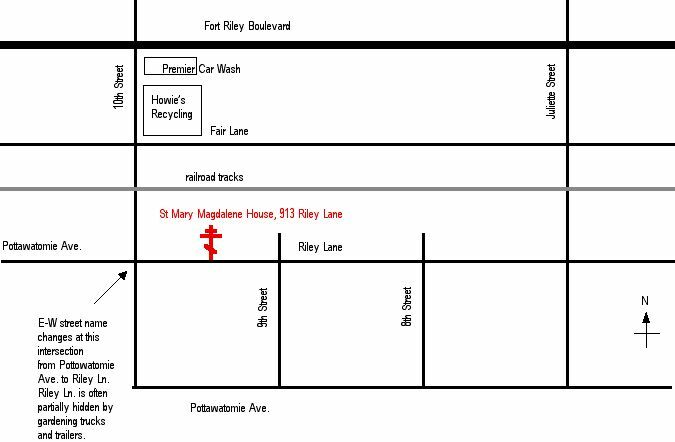 Standard map sites and GPS services have updated their maps of the neighborhood around St. Mary Magdalene House to allow correct navigation, but parishioners and visitors to the Chapel are quite insistent that the extra detail provided in this map is very helpful in finding the Chapel.